But might fall apart, too. Who knows? Feeling a bit worn down today. I did read two fantastic books, though. I read the book version of The Spectacular Now by Tim Tharp. It’s just as amazing as the movie, but in a different way. It’s more subtle and more complex. The movie was really careful to avoid suggesting certain things. It was careful to avoid the idea that the main love interest might be becoming a drunk. It was careful to avoid the notion that the protagonist might be an unredeemable boozehound and all-round loser. It was careful to avoid the idea that he was only staying with the girl out of pity and that, in the end, the only girl he really loved was the one who he started the movie with. In the book, everything is much more ambiguous. The main character is just as warm as in the movie. Maybe even a bit more so, since you’re so fully inside him that you can really see he doesn’t wish any harm on anyone. And since you spend more time with him, you’re more fully able to see how charming he is. But there’s a darker side there. He’s not just feckless, like he is in the movie. He’s genuinely lacking in empathy for other people. It’s a brilliant portrait. It would’ve been so easy to paint him as a hapless loser or as a misunderstood rake. Instead, it walks a middle path. He’s a very complex person. 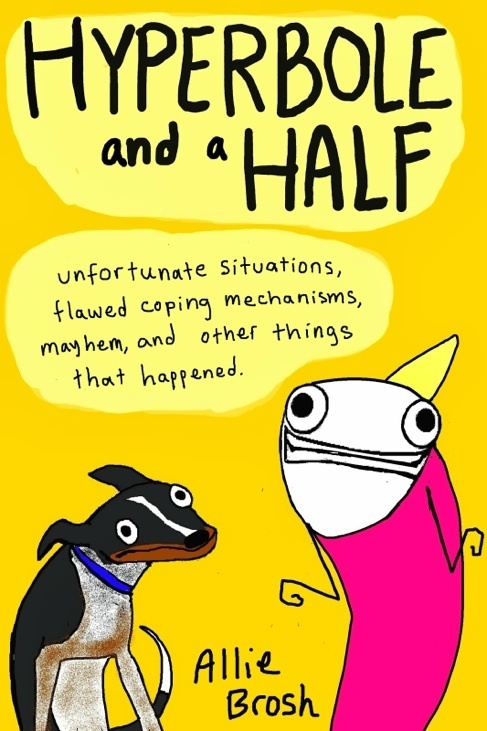 Also read Allie Brosh’s Hyperbole And A Half book. I’m on record as saying that I think laughter is mostly a performance. When you’re watching a comedy in theaters, people are just laughing all over the place–laughing so much that you find yourself laughing along–but when you’re watching it by yourself in your living room, you hardly ever laugh out loud. Well, I read this book by myself, in a living room, and I laughed so hard and so often that my nose dried out and now my sinuses are crackling in a mildly painful way.